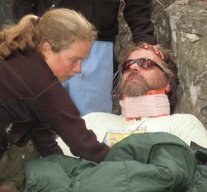 The Standard Wilderness First Aid Training Course (WFA) is a 3-day class designed to introduce you to the concepts of medical care in a wilderness setting. The class focuses on basic life support skills, minor trauma, spine assessment, selected environmental topics, toxic and allergic reactions, the ruling out process, and "common" medical emergencies. The majority of time is spent in hands-on skills practice and simulations. The course includes CPR certification. It is good training for outdoor jobs in front-country locations (areas with vehicle access and within one hour of urgent care). In contrast, the Wilderness First Responder course (WFR) is a 10-day course designed specifically to meet the needs of wilderness guides, expedition leaders, and outdoor instructors working in back-country locations (areas without vehicle access and/or beyond one hour of urgent care). It is the outdoor education and recreation industry’s standard for wilderness medical training. It is the wilderness medicine training course for outdoor professionals...and the course you want your friends to have taken before you travel with them. While the focus of the WFR remains on expedition medicine, the information and skills learned during the Wilderness First Responder course may be directly applied to other emergency medical situations where rapid EMS and advanced medical care is not available e.g. : disaster relief, remote health care in third world countries, etc. The course includes certification in adult & child CPR and AED. Both the WFA and WFR courses are taught by the Wilderness Medicine Training Center (WMTC), a leader in the field of wilderness first aid. WMTC is an affiliate of and teaches to the practice guidelines published by the Wilderness Medicine Society and to position papers published by the National Association of EMS Physicians. WMTC Wilderness First Aid certifications are recognized by other wilderness medicine providers, insurance companies, guide licensing boards nationwide, and numerous organizations such as the American Camping Association and Boy Scouts of America. You can learn more about both WFA and WFR courses on the WMTC website. These courses may also be used to re-certify WAFA, WFR, and WEMT certifications with the successful completion of an on-line re-certification exam and additional $25 fee. You can register for either the WFA or WFR on our registration page.